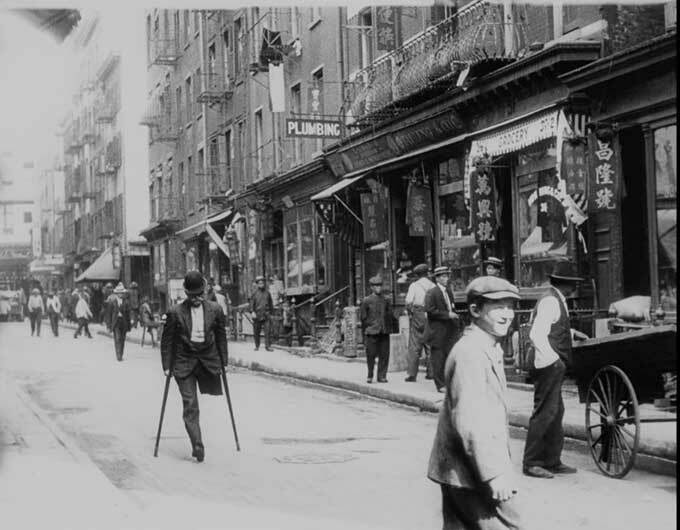 This film of New York City was shot in 1911, and it is in excellent condition. Everything is in sharp focus. It is as vibrant and picturesque as a Scorcese period film. Almost everyone wears a hat. All the men wear suits and ties. There are all kinds of public transportation - trolleys, cable cars, trains. Lots of horse-drawn carriages, and more automobiles than I would have guessed. This documentary travelogue of New York City was made by a team of cameramen with the Swedish company Svenska Biografteatern, who were sent around the world to make pictures of well-known places. (They also filmed at Niagara Falls and in Paris, Monte Carlo, and Venice, although New York 1911 is the only selection in the Museum’s collection.) Opening and closing with shots of the Statue of Liberty, the film also includes New York Harbor; Battery Park and the John Ericsson statue; the elevated railways at Bowery and Worth Streets; Broadway sights like Grace Church and Mark Cross; the Flatiron Building on Fifth Avenue; and Madison Avenue. Produced only three years before the outbreak of World War I, the everyday life of the city recorded here—street traffic, people going about their business—has a casual, almost pastoral quality that differs from the modernist perspective of later city-symphony films like Paul Strand and Charles Sheeler’s Manhatta (1921). Take note of the surprising and remarkably timeless expression of boredom exhibited by a young girl filmed as she was chauffeured down Fifth Avenue in the front seat of a convertible limousine.